Azterra VET in the Azrock Collection combines the look of granite particles with soft, flowing marble in 14 color choices. 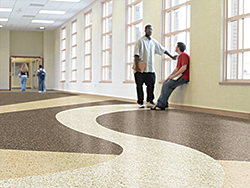 Enhanced with Tritonite II, a polyurethane-reinforced construction, and is able to withstand heavy foot traffic. Each tile contains a minimum of 6 percent post-consumer and up to 23 percent pre-consumer recycled content.